When it rains it pours. In the space of a week, several wonderful LPs fell into my lap. I found a beautiful copy of Jack Kerouac’s second record on Hanover, Blues and Haikus, at a bookstore in Washington DC. On eBay, I won a somewhat beat up copy of San Francisco Poets on the rare Evergreen Records label. Luckily, it sounds better than the sleeve looks. That same weekend at a record shop in Baltimore, I tracked down the Hanover Records reissue of the San Francisco Poets album. The San Francisco Poets albums are a great listen and an interesting story. The tale begins with one of the most influential and important literary magazines of the post World War II era: Evergreen Review No. 2, also known as the “San Francisco Scene” issue. As I have mentioned before, Evergreen Review was Grove Press’s literary magazine outlet. The first issue of the magazine had a decidedly European flavor with contributions by Jean Paul Sartre, Henri Michaux, and Samuel Beckett. By the mid 1950s, Beckett was the star performer in the Grove Press stable. Waiting for Godot proved a big seller and created interest in Beckett’s earlier work like Murphy and Watt. It was not until Issue Two that Evergreen Review really distinguished itself and made a mark with the general public. 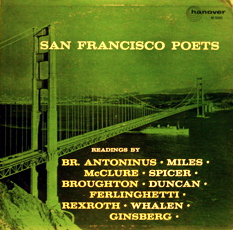 By 1957, San Francisco was the center of the literary landscape in the United States. This was in large part because of the activities of the Beat Generation. The Six Gallery reading, City Lights Bookstore, the publication of Howl, and the Howl trial all placed San Francisco under the microscope. In mid-1957, Evergreen Review devoted an entire issue to this burgeoning scene. Barney Rosset, the maverick publisher of Grove Press, hired Don Allen to edit the early issues of Evergreen Review. Allen, who was centered on the East Coast, enlisted the help of Kenneth Rexroth and Allen Ginsberg to shape the second issue. The editorial assistance of Rexroth and Ginsberg highlights the fact that what was presented as a single, unified San Francisco Renaissance was in fact a highly competitive and divided community. Rexroth represented the old school, San Francisco / Berkeley community that wrote and taught in the city immediately after World War II, and in Rexroth’s case, before. Writers such as Jack Spicer, Robert Duncan, and Robin Blaser spearheaded the Berkeley Renaissance which began in the late 1940s. This group built the infrastructure of galleries, salons, college lectures and readings upon which the later Renaissance was built. The Berkeley poets were openly gay and highly learned. Much of their work harkened back to the mystical poetry of the Renaissance and Elizabethan eras. This poetic debt to the past was part of the reason the flourishing in Berkeley was called a Renaissance. On the other hand, Ginsberg brought to the table the new San Francisco of Gary Snyder, Philip Whalen, Jack Kerouac, and Michael McClure. These poets and writers were hip and hot exploding old poetic forms and searching for new topics for poetic treatment. Many older poets felt this new breed stormed in and stole the spotlight taking advantage of the groundwork laid by an earlier community. The competition and bad feeling between the two groups were best exemplified by the adulterous affair carried on by Robert Creeley with Kenneth Rexroth’s wife. The incident symbolized the new turks’ invasion of the old guards’ turf. Yet Evergreen Review presented these warring factions between the same covers. Kerouac, Ginsberg, and, strangely, Michael Rumaker were the centerpieces of the issue. Donald Allen included a lengthy piece of Howl (a very early appearance and a brave one as the Howl trial was underway) as well as Kerouac’s “October in the Railroad Earth.” Short selections by Michael McClure, Ferlinghetti, Gary Snyder, and Philip Whalen were the other salvos of the young guns. The Berkeley poets were equally represented with selections from Robert Duncan, Jack Spicer, and experimental film maker James Broughton. Henry Miller, Josephine Miles, Rexroth, and William Everson (Brother Antoninus) provided a nod to the early days of experimental writing in post-war San Francisco area. Don Allen’s experience in editing the early Evergreen Reviews provided the groundwork for his monumental undertaking of the late 1950s: the genre-defining New American Poetry anthology. Evergreen Review No. 2 sent shockwaves throughout the San Francisco literary community. The failure to include Robin Blaser ruffled the feathers of the Berkeley poets while other writers like Kenneth Patchen refused to be included at all. Patchen wrote, “I refused to be interviewed or photographed by Life magazine in connection with their [San Francisco] story: I ignored all similar requests for material and the like from The Evergreen Review, The Cambridge Review, etc. Again, there is a simple, uncomplicated reason for this: I am not and never have been ‘a regional poet. '” Several writers agreed with Patchen and expressed dissatisfaction with their pigeonholing in the pages of Evergreen. With the general public, the issue proved to be a major success encouraging many would-be poets and artists to come out to the Left Coast. Not surprisingly, Rosset sought to capitalize on the success of this single issue. He decided to recreate the magazine on vinyl and started Evergreen Records. 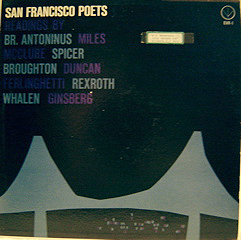 In 1958, San Francisco Poets was pressed featuring Allen Ginsberg, William Everson, Jack Spicer, Kenneth Rexroth, Philip Whalen, Robert Duncan and others. The album was a nice mixture of old and new scenes. This recording effort reminds me of the East Village Other LP of the late 1960s. That underground newspaper attempted to recreate the feel and content of the periodical on wax. The resulting album is definitely a trip and captures the sometimes inspired and sometimes tedious lunacy of the times. Another similar undertaking was the Zapple label. Zapple was the Beatles spoken word outlet. Barry Miles in his memoirs details this story. Miles recorded Charles Bukowski, Charles Olson, Richard Brautigan and others, but none of these recordings were issued on Zapple. The Evergreen LP is the model of simplicity. No jazz accompaniment with very simple (maybe even primitive) production values. The LP features Ginsberg reading Part I of Howl. This was Ginsberg’s first recording and, I believe, an early reading of Howl before the poem was finished. The text Ginsberg reads on the record differs from the text printed in Evergreen Review. The LP included a printed text to accompany the record. This piece of ephemera is highly prized by collectors since it rarely remained with the record. Sadly, my copy is missing the text. Ginsberg gives a very lively reading which is matched by the audience participation. The laughter and interplay of the audience adds considerably to the reading as does Ginsberg’s running commentary on the poem. The rest of the poems sound as if they were recorded in a studio. Each poet states their name and begins reading a selection that was featured in Evergreen Review. I was much impressed by the spirited, powerful reading of Jack Spicer. Spicer was a notoriously reluctant performer, but he sounds confident and on top of his game here. This recording and his appearance in Evergreen Review would be the highpoint of his mainstream success. Spicer had a love-hate relationship with publication. Despite his distaste for print, he founded or helped found some legendary publications and presses. White Rabbit Press and J Magazine are beautiful examples of the small press and little magazine and important time capsules of the San Francisco Scene. From what I can tell, Evergreen Records only issued this one record and the release must have been limited given its rarity today. Much more common is the Hanover Record reissue from 1959. Previously, I detailed the story surrounding the founding of Hanover Records. I believe this record was the second spoken word offering after Jack Kerouac and Steve Allen’s album. 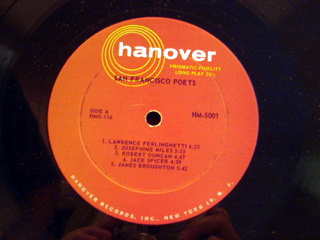 The Hanover San Francisco Poets features different sleeve art but it is the same recording. Both albums feature Harry Redl’s photographs of the poets on the back sleeve. These photos also appeared in the San Francisco Scene issue. Redl’s works, which include several shots of Allen Ginsberg around the publication of Howl, remain the iconic images of the San Francisco Renaissance. So where does Burroughs fit in? Burroughs proves on one level just how arbitrary the creation of a single, unified San Francisco scene was. In Spring of 1958, the Chicago Review issued their Ten San Francisco Poets issue as a response to Evergreen Review and the San Francisco LP. Once again, Allen Ginsberg was a major force in the gathering of material. Ginsberg provided Irving Rosenthal, the lead editor of the Review, with most of the contributions for the issue. The Ten Poets issue is decidedly young in tone. Robert Duncan is represented but all of the other contributors were recent arrivals to San Francisco. 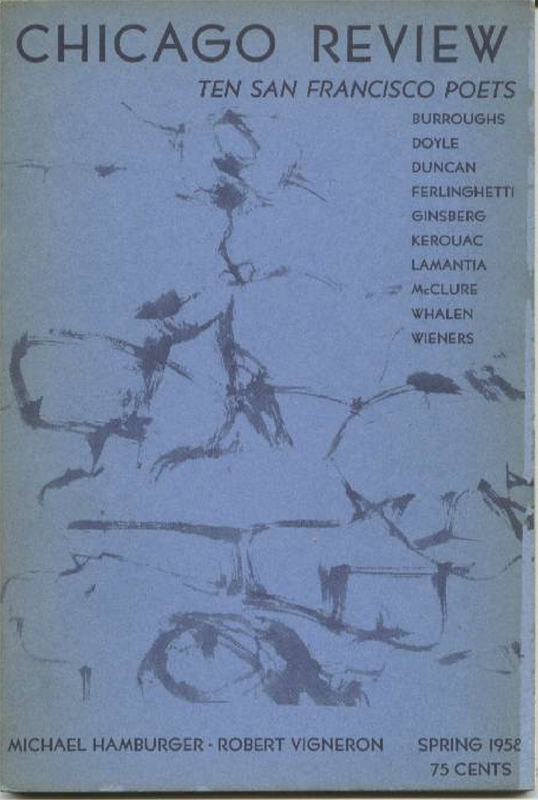 Ferlinghetti, Whalen, Ginsberg and McClure appeared in Evergreen Review, but Kirby Doyle, Philip Lamantia, and John Wieners were new faces. Doyle and Wieners proved especially green and unknown in the literary world. Also included in the submissions were episodes of Burroughs’s Naked Lunch. Ginsberg, always seeking to promote the work of Burroughs, inserted Naked Lunch manuscript material along with the San Francisco portfolio. Burroughs had never been to San Francisco and clearly Naked Lunch possessed nothing of the San Francisco or Berkeley vibe. Interestingly, it was Burroughs’s work that won over Rosenthal and most of the editorial staff of the Chicago Review leading the Review to get behind Naked Lunch and to forge ahead with its continued publication. The rest (Big Table, the Post Office, censorship, Olympia Press, et al) is history. Written by Jed Birmingham and published by RealityStudio on 18 August 2006. The recordings Barry Miles made for Zapple were released on other labels. The Olson was put out by Folkways records and is still-as everything recorded for Folkways-still in print. It came out in 1975, 6 years later. The Brautigan was released early in 1970 on Harvest, a branch of Capitol as “Listening to Richard Brautigan.” The Bukowski was released in the late 1970s on John Fahey’s old label Takoma as “Bukowski reads his poetry” (it was a live recording.) Zapple wasn’t merely a spoken word label- it was to be all kinds of avant-garde things. The first George Harrison release, Electronic Sounds was on Zapple.